We specialize in hanging all types of art, including framed mirrors, textiles, object d’art and Asian screens. We focus on the creative arrangement of any number of pieces in your home or office. Before each installation, everything is carefully placed to complement and enhance the setting, as well as satisfy your personal taste. With over 18 years of experience no project is too challenging or too large. Whatever the composition of your walls, the installation will be secure. For oversized items and bigger projects, we have a full team of professionals on hand. We work efficiently, neatly, and accurately. 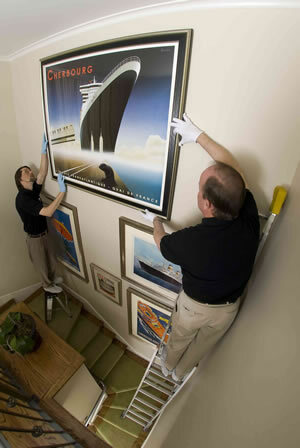 We are fully insured to cover the artwork we handle up to one million dollars. Our services are offered to both residential and commercial clients, as well as interior designers. We also do installations for special events and projects, such as the San Francisco Decorators Showcase. Our mission is simple: to use our expertise and professionalism to provide the perfect placement solution, a secure installation, and an enhanced living or workspace — every time. please phone us at 415.948.9038.